The New York Rangers have been rolling this season, but they’re about to face some real adversity with an injury to Mika Zibanejad on the table. The centre will be out six to eight weeks, the team announced on Monday. Zibanejad broke his left fibula on Sunday night when he crashed awkwardly against the end boards. Zibanejad has 15 points in 19 games, including five goals. Five of his points have come on the power play and he’s registered 47 shots on goal thus far. The 23-year-old Swedish forward has been a big part of New York’s robust offence thus far. The team leads the Metropolitan Division with a 13-5-1 record and a league leading 76 goals for. The Rangers have the biggest goal gap in the league, with just 45 goals against for a differential of plus-31. That showcases sure dominance, even if the Montreal Canadiens and Chicago Blackhawks are ahead of them in the standings for now. J.T. 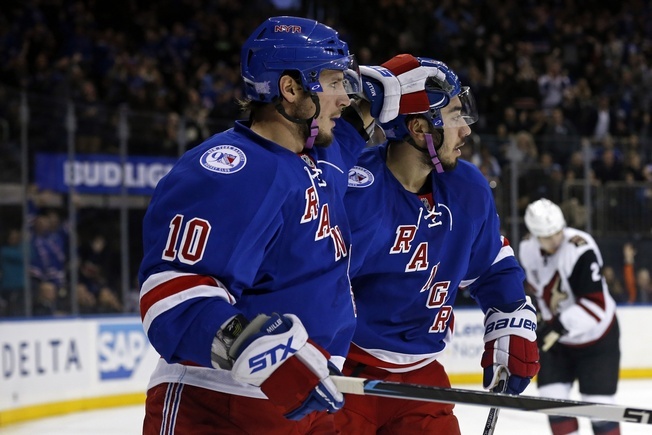 Miller leads the Rangers in scoring with 17 points in 19 games, while Kevin Hayes has 16 points in 19 games. Michael Grabner has 11 goals in 19 games, while newcomer Jimmy Vesey has been impressive with a dozen points so far. So, the Rangers do have the offensive depth to weather the loss of Zibanejad and the loss of Pavel Buchnevich, who’ll be out an estimated three weeks with a back injury. Vigneault will have to shuffle the Broadway deck, but he’s got plenty of pieces to work with. Oscar Lindberg will see more ice time. He’s been scratched seven times over the last 14 games and he’s played on the blueline in practice situations, but he’s a natural centre and will likely suit up on the fourth unit with Jesper Fast and Josh Jooris. Hayes will sit between Chris Kreider and Mats Zuccarello on the first unit, while Grabner will find time on the wing on a line with Derek Stepan and Rick Nash. The Rangers also claimed forward Matt Puempel off waivers on Monday, giving them a 13th forward.